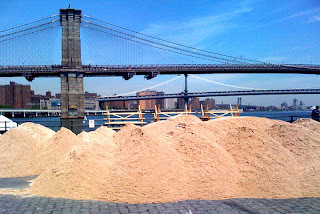 Water Taxi Beach has opened a second outpost of its cool summer only concept of outdoor fun and games in Manhattan, yes that is the Brooklyn Bridge the backround ! Located in the South Street Seaport /Pier 17 Complex near Water Street, this venue features a 9 hole putting green,ping pong tables, sandy beach, clam shack and full cocktail service. Music is expected to start soon on Thursday- Saturday nights on the beach. The best part of this location is you can get to it by Bus, Train,Car or Boat unlike its Long Island City sister which is pretty much accessible only by New York Water Taxi.